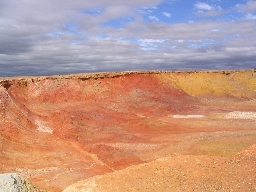 So we headed South to see Wilpena Pound, but we went stopped off at Coober Peedy first. Now Coober Peedy is a most unusual place which at first look resembles some kind of lunar landscape due to the opal mining. People we had met along the way said don't just pass through and be horrified by how it looks. Take a tour and you will really enjoy it. So we did. And it was true. We visited the underground homes people live in (as seen in Mad Max III), and a fabulous Serbian Underground Church. We visited opal fields and learned how they mine for it, and yes we fossicked through some spoil heaps and got a few bits for ourselves (low value because it lacks colours). We also saw bits of set left from when they filmed Pitch Black. Things just tend to get left around and last for a long time because there is no moisture and rain. Just sun. Alas, I don't have any good pictures of Coober Peedy on the tour, just one which shows some opal mining spoil heaps in the distance. 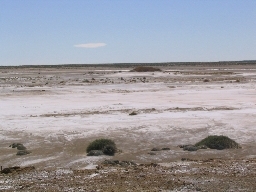 At first glance much of the landscape looks natural, but look closer and the little light mounds are actually spoil heaps from test drilling looking for opals. When they find an opal rich layer you get even bigger spoil heaps. Lots of small ones like this means they didn't find any good area to mine. Next we headed to the Oodnadatta Track. What we discovered is that the track was for the most part in great shape. Almost as good as the sealed highway. 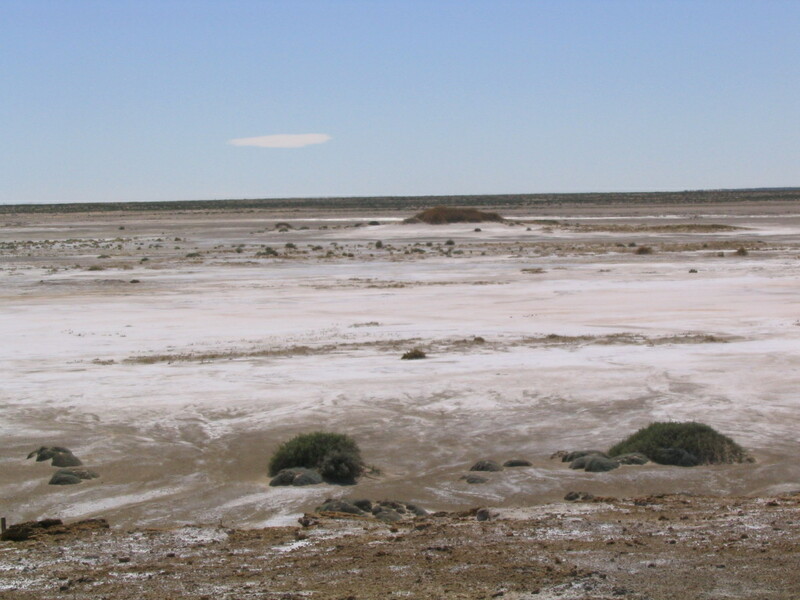 It took us through strange desert landscapes, along the old Ghan railway, and past Lake Eyre. We were excited at the prospect of seeing some mound springs, which we had heard about. Perhaps there would even be a hot soak in some spring water. Alas, that was not to be because the springs were look but don't touch in order to preserve them. 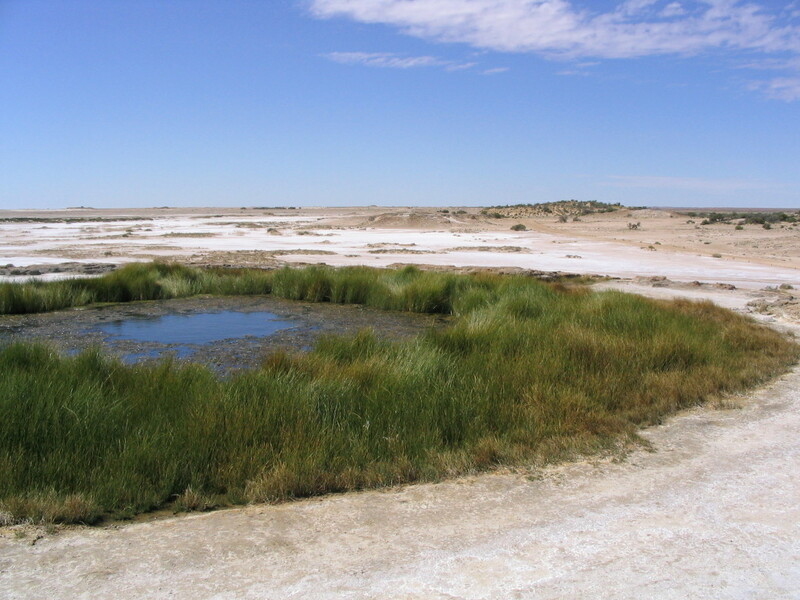 There are a number of springs and they are raised up on mounds which they build themselves as they bring up hot water and minerals. They are located around the rim of a great artesian basin and present a very strange picture rising up in the middle of a desert. But stranger yet is what you see when you get to the top. Amid all the salt and mineral pans with little vegetation you suddenly find lots of green growing in and around the spring itself. 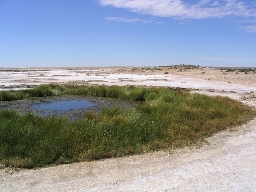 The water is hot to touch, and these plants spend their time cooking slowly in hot very salty and mineral water. 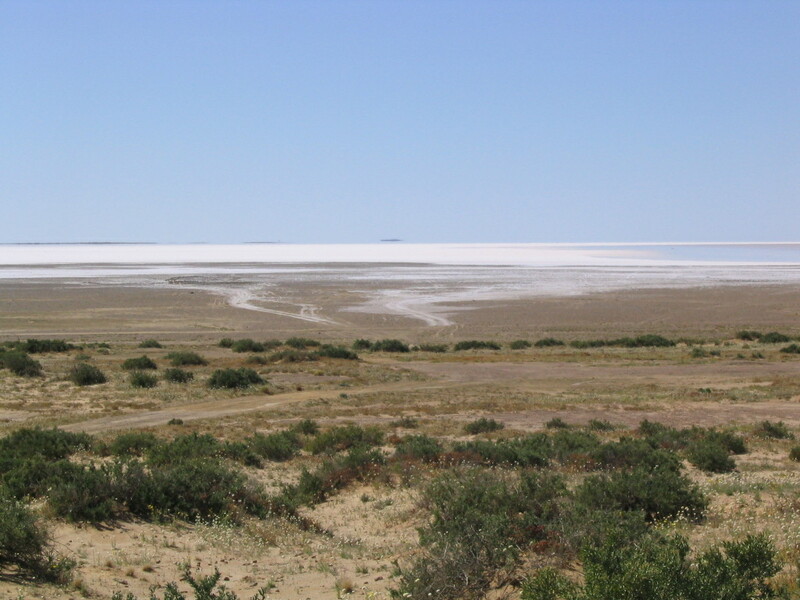 Next on our path was a view of Lake Eyre which usually has no water in it. This was the "Great Inland Sea" the early European explorers believed in, except that they arrived a million years too late. 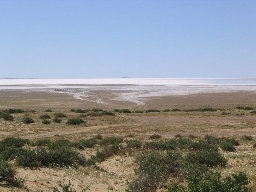 The sea had long since dried up leaving behind this huge salt pan which occasionally gets flooded in an exceptional year. We were lucky to see it with a little water in it...and great mirages suggesting more water than is actually there. We originally wanted to go out on a road to a campground but were warned off by advice that it was in terrible shape and would wreck our vehicle. From the vehicle tracks heading out closer to the edge in this photo you can see that some people are keen to go closer and probably get bogged. We were happy to watch from a safe distance. Next we came across a sign which said "Ocre Cliff". In addition to the proper brown coloured official sign there was an old tyre propped up which was painted white and had "Ocre Cliff" on it as well. 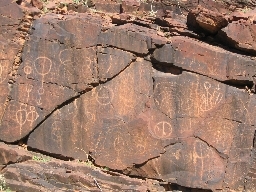 We were familiar with the brown official signs for scenic things, and with individuals and aboriginal communities in the bush who stick a tyre out the front to mark an entrance. This was the first time we had seen both. Must be important! It was. A pristine site of great Aboriginal significance unmolested by Europeans. Incredible. So after a couple of days on the Oodnadatta track we came out on the seal. It was late in the day and we looked for a place to camp. We saw some interesting signs advertising camping in an abandoned town called Farina and decided to try it out. Great camp, with hot showers if you lit a little fire under the "donkey" to heat it. 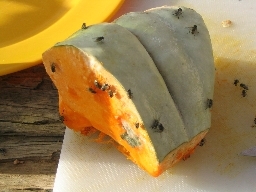 We used our camp oven to make a stew and thought it would be good for people to see what the flies are really like in this desert area. We wore our fly veils much of the time. Here we are slicing up our slightly old pumpkin to put it in the stew. Yum. At least the flies go to sleep after dark and if you get up early you can have breakfast before they wake up. We left the seal again after a few hundred kilometers (and an espresso coffee) and headed out into the North Flinders and a place of legend called Arkaroola Wilderness Park. This is a geological paradise set up by Reg Spriggs in a very early attempt at ecotourism. We stayed there three nights and did lots of walks plus a bit of serious 4WD work, plus a little astronomy in their observatory. The worst of the 4WD was done in Ark-mobiles rather than our own vehicle. 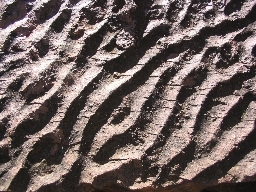 Here we see some ancient sea bed rock with the waves imprinted on it. We were thrilled to see the endangered yellow footed wallaby on our treks. We also saw lovely radioactive hot springs (still no hot pools to soak in), old mines, and all sorts of other kinds of rocks rocks rocks. Old rocks. 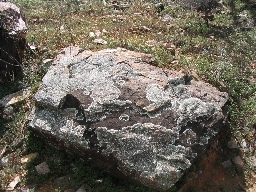 Very old rocks. Rocks with uranium in them. Rocks with things growing on them. Rocks with fossils. Australia is serious rock territory and Ark is an especially fine place for seeing them. From Ark we made our way further south calling in for overnight stays (and hikes) in several gorges. 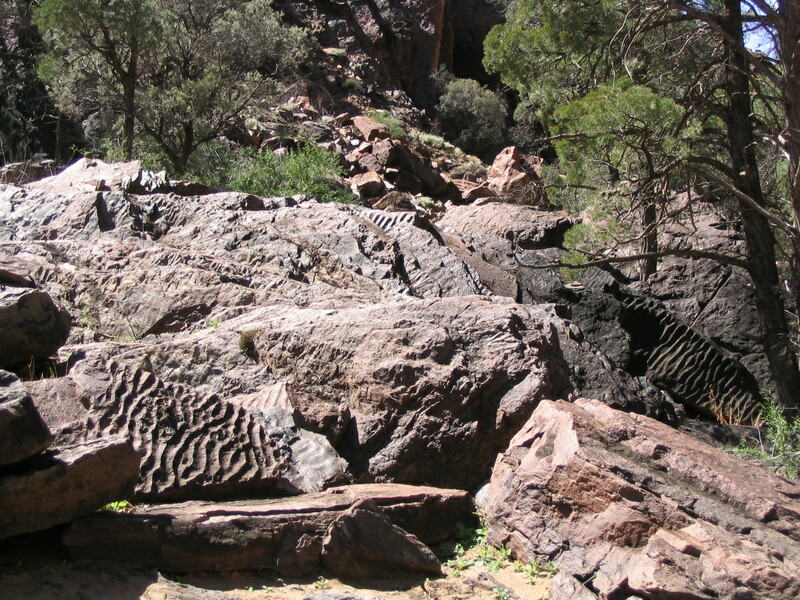 First up was Chambers Gorge which had a rock used for scribbling on by the original inhabitants. More seriously this was a very fine petroglyph site. On our wanderings in Chambers Gorge we also came across some wildlife which was slow enough to pose for closeups. 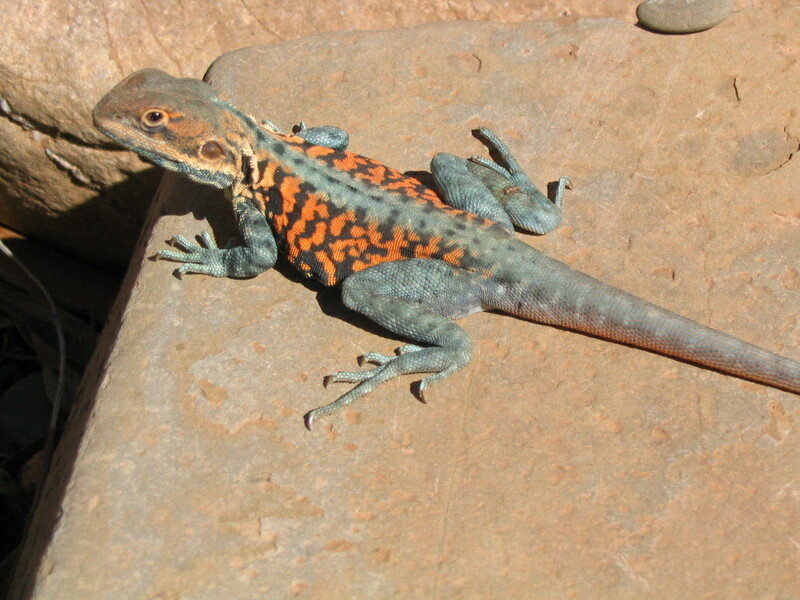 This is a "Painted Dragon" found in this desert area. I kept taking photographs and getting close and closer, expecting that it would dash away at any time. But the air was cool, and the sun was warm, and it just couldn't be bothered running into the shade under the rocks so it waiting until I was just a few inches away. 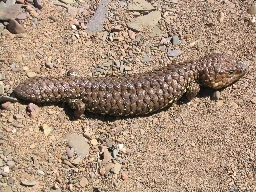 Further back along the track we came across this Shingle Back Lizard. Don't ask me what makes something a "dragon" or a "lizard" in common names. Dragons sound like they should be much bigger, but this Shingle Back is about the same size as the Painted Dragon. But as you can see it has rather different body proportions. 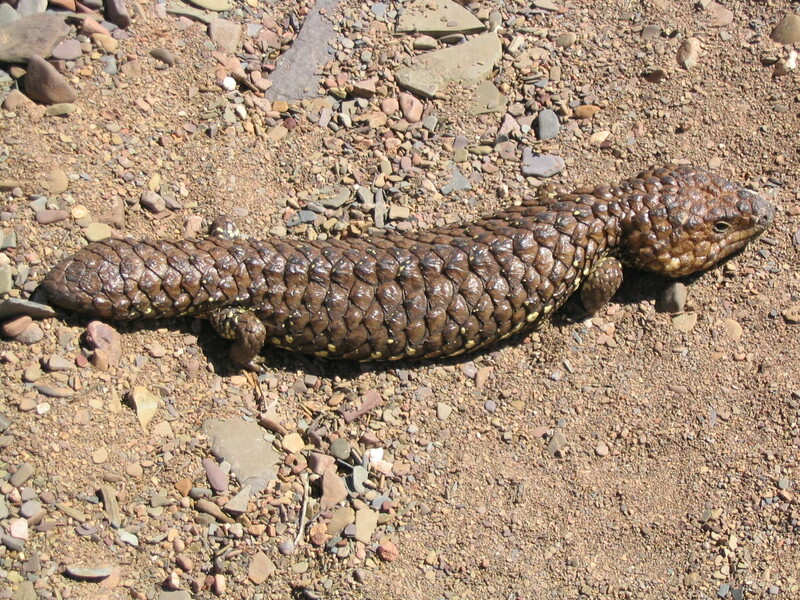 We saw three of these guys this day, two of them crossing the road (slowly) in front of us. But sometimes they are a bit too slow -- later on we saw one which had been flattened on the road. This tale finishes abruptly here on the threshold of Wilpena Pound. We are in Melbourne as we write this and have just two weeks left to get back to Brisbane and to catch a flight back to NZ on the 17th of October. Note that this is a quick post before we leave Melbourne, and it hasn't been fully proof read nor vetted by the Geographical Committee for accuracy of place names. But we wanted to get it out there while we have a telephone line.